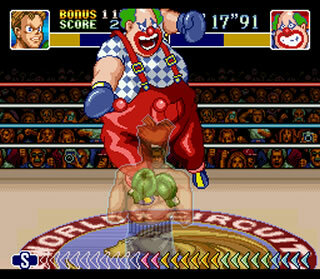 Certain Characters, such as "Mad Clown", have attacks that are not punches. Everybody talks about Mike Tyson’s Punch Out! 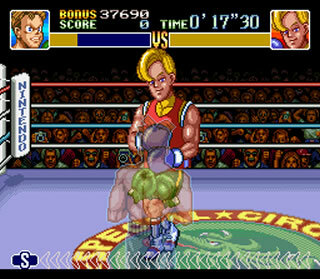 (or Punch Out! it was known when licencing issues arose) as one of the best boxing gmaes out there. It’s not serious, which is why it’s so well loved. I’m not going to talk about Punch Out!, as enough people on the interrnet talk about it, I’m talking about Super Punch Out!, the SNES sequel of the original game. Super Punch Out! was released in 1994 to sizeable, but not a huge amount of fanfare. In this game, you take control of a character (who isn’t given a name like Little Mac in the first game, instead you give your pugilist a name), who wants to become the best boxer in the world. You begin on the Minor Circuit, and there are four circuits to go through, each with 4 fighters over ever increasing difficulty. The Minor Circuit has two characters who are easy to beat quickly (Gabby Jay and Piston Hurricane can be defeated in under 10 seconds), and have two characters that have noticable weaknesses (Bald Bull & Bear Hugger). And that pretty much sums up the tactics you have to employ in this game – some characters can be beaten by learning their weaknesses and attacking based on that, others require a more complex tactic of learning individual moves and the counter to them. Narcis Prince is up there with one of my favourite characters in any game – impossible until you first hit him in the face. I said it wasn’t the most realistic boxing game in the world, and it shows with the opponents, as by halfway through the Major Circuit the rulebook gets tossed completely out of the window with the game’s unique boxers. You have Masked Muscle – a masked Mexican wrestler who utilises headbutts and spits. You have Mad Clown – who throws juggling balls at you and has a nasty double head punch. Finally, my favourite, you have Narcis Prince – a british royal who to defeat you need to punch in his face, as he’s so vain he protects it immensely (Everybody said it was a play on words on the word Narcissist, but I felt he was a shot at “Prince” Nasseem Hamed, a British boxer at the time who was rather vain). Each of the 16 boxers is unique, and I could probably name all 16, and the order you face them, even though before writing this review I hadn’t played this game in five years. Secondly, the controlls are fairly intuitive. You have a left and a right punch. Up with the left and right punch attacks the head. You block with the control pad as well as weave, and land enough punches you can launch either a super punch or a super combo. The controls take about 17 seconds to learn, and none of the slow tactical boxing in more real boxing. You can simply punch and punch and punch. However, if you are to do that, you’ll probably find yourself on your arse in three or so characters. This game is probably one of my favourite boxing games out there (I think Victory Boxing for the PS1 is slightly better as it’s more tactical, as is Wii Sports Boxing for it’s sheer spectacle), and is well worth adding to your collection. This game is super rare amongst collectors, and goes for a fair bit of money. And with good reason. As well as being stupidly rare, it’s actually one of the gems of the Super Nintendo Era. It offers quite a challenge and a difficulty curve is pretty much perfect – the Bruiser Brothers at the end are as hard as Gabby Jay is easy – and with great grapgics, fun gameplay, and unique characters, this game is quite a step up from the Nintendo Original.